Triton has supplied both elements of a twin waterproofing system in the construction of the basement at the new DMC Building at Goldsmiths, University of London. This approach was proposed by City Basements (Toureen Mangan) and Triton, and accepted by the architects, Stride Treglown of Bristol and main contractor, Willmott Dixon Construction. 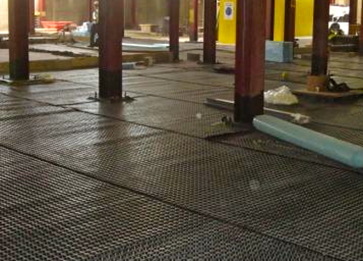 Therefore the Triton watertight concrete system – the primary method of waterproofing – has been backed up by a Platon cavity drain system which was installed after completion of the watertight concrete construction. Phase 1 involved the specification of Triton’s TT Super Admix to produce 900m³ of watertight concrete used in the construction of the concrete capping beam to the top of the piles, the reinforced concrete liner walls (150mm – 200mm) and the reinforced concrete floor slab (300mm). All construction joints to the capping beam, wall capping beam, wall/floor and floor/floor joints were waterproofed with Triton’s TT Swellmastic and TT Waterstop forming a completely watertight concrete system. Phase 2 of this major waterproofing project involved the installation of a cavity drain membrane system. Although a watertight concrete system had been specified as described above, when this type of system is used alone, it can still be compromised by shrinkage, thermal cracking and poor joint detailing, leading to leaks which need to be repaired – and the leaks will only become apparent when water comes to bear on the structure. Platon Cavity Drain Membranes were therefore specified as the second element to provide the extra security of a twin waterproofing system. Cavity Drain Membranes work on the principle of allowing water to continue to penetrate a structure but control it in the air gap between the structure and their studded profile and divert it to a suitable drainage point. They do not allow pressure to build up against the internal construction and the air gap behind the membrane allows the structure to breathe and to some extent to dry out. Cavity drain membranes are lose laid on floors and fixed to walls using special plugs and sealing materials.Once the membrane has been fitted, wall surfaces can be dry lined or plastered directly and floors can be screeded or a floating dry board system installed. At Goldsmiths, 800m² of Platon Multi, a BBA accredited, 5mm Polypropylene membrane, was applied to the walls. 1800m² of heavy duty Platon P20, a deeper studded HDPE membrane, was laid to the floors. 300 linear metres of Triton Aquachannel (a drainage conduit fitted to the perimeter of the basement at the wall/floor junction) was laid to direct any water which may ingress behind the membrane to the sumps. The basement will house two lecture theatres, TV and photographic studios and associated areas. The basement is 4.5m deep and extends to the complete 1800m² footprint of the new, two storey building above.